Andres Manuel Lopez Obrador’s “Together We Will Make History” coalition is sweeping across Mexico, and it has established him as the front-runner to become the next president of the United States' southern neighbor. 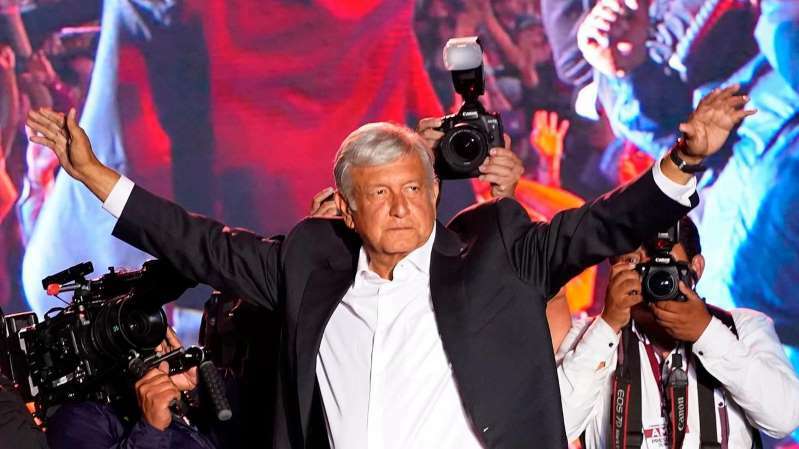 The 65-year-old Obrador, or AMLO as he is known, is a far left populist who was once the mayor of Mexico City. His growing popularity with Mexicans was most evident Wednesday night when he filled the Azteca stadium in Mexico City, the country’s largest, with more than 80,000 supporters. Mexico is currently run by the center right Institutional Revolutionary Party, or PRI, led by the current President Enrique Pena Nieto. His successor, Jose Antonio Meade, is a distant third in the race while second is held by Ricardo Anaya, from the National Action Party, once led by President Vicente Fox. Obrador is the grandson of a farmworker and began his political career building houses for the Chontal Maya, Mexico’s indigenous poor. He led grassroots environmental protests against PEMEX, the giant state-owned oil company, and disillusioned by corruption in the other two political parties, Obrador started his own political party, MORENA, four years ago. President Trump has not been a factor in the Mexican election cycle as he was equally denounced by all candidates. Instead, the campaign has mostly focused on three topics: violence, corruption and the economy – which has remained largely flat, especially in the less-industrialized south. Obrader, who is considered a charismatic firebrand and progressive thinker, promises to increase the minimum wage and raise the standard of living for the 40 percent of Mexicans who live on less than $5 a day. In Mexico, drug use in not a problem, yet more than 240,000 lives have been lost in the last decade because of infighting between drug cartels producing or trafficking cocaine, cocaine, methamphetamine, fentanyl, marijuana and heroin to the U.S.
Obrador has said it is not up to Mexico to fight America’s drug war and instead proposes giving amnesty to opium and marijuana growers and ceasing the use of the military against the cartels. Obrador hopes to quell that discontent by letting police handle the crime, going after money laundering and improving the economy, according to his campaign manager, Tatiana Clouthier Carrillo. Abandoning the drug war however will present problems for U.S. agencies like the Drug Enforcement Administration and the U.S. military, which have worked closely with the Mexican navy to track down and capture drug traffickers in the U.S.-led ‘kingpin’ strategy. Arnold is referring to a portion of the $3.2 billion the U.S. provided Mexico through the Merida Initiative, a security cooperation agreement between the U.S., Mexico and countries in Central America to combat the drug trade. “His election is going to make life more complicated for the United States,” added Wood. Obrador favors renegotiating NAFTA to better protect Mexican farmers, even though the agreement helped turn Mexico into the world’s fourth largest vehicle exporter. He also opposes private and foreign investment reforms in PEMEX, Mexico’s giant state-owned oil company. In foreign policy, Obrador has said Mexico will not be a piñata for the U.S., and promised to challenge the Trump administration’s immigration policy – both on the rights of Mexicans living in the U.S. and the journey of Central Americans traveling to the U.S.-Mexico border. Clouthier, however, claims Obrador is not advocating for open borders, but said under his reign, Mexico will not be America’s piñata. “When Andres Manuel says we are not a piñata, it means we need to talk like equals,” she said.